When Lilli Marx returned to Germany in the autumn of 1946, she threw herself energetically into the task of rebuilding Jewish life in the country. She was particularly involved with the League of Jewish Women (JÜDISCHER FRAUENBUND, JFB), which she re-established together with Jeanette Wolff (1888–1976), Ruth Galinski (1921-2014), Inge Marcus (b. 1922) and others. Pursuing the great tradition of the League, she created an important forum for the women survivors of Germany. Lilli Marx grew up in her birthplace, Berlin, in a liberal Jewish family. In 1934, insulted by fellow pupils, Lilli switched from a public to a Jewish school, which she completed at the middle-school stage. Further schooling and professional training were denied her. In 1938, at the age of eighteen, she emigrated to England with a “Domestic Permit.” Her parents were deported in 1940: her father Arthur Behrendt (1888-1941) was first brought to Sachsenhausen but died in KZ Neuengamme in 1941; her mother Henriette, born Silberstein, to Ravensbrück but died in the killing center Bernburg an der Saale in 1942. She met her future husband, Karl Marx (1887–1966), in England. In 1946, the couple returned to Germany, settling in Düsseldorf, where Karl took over the publication of a Jewish newspaper. In 1948 this grew into the Jüdischer Allgemeine, which remains the only national Jewish weekly in Germany. Lilli Marx worked with and for the paper for more than twenty years. In 1951, Lilli and Karl Marx were among the founders of the Gesellschaft für christlich-jüdische Zusammenarbeit (Society for Christian-Jewish Cooperation) in Düsseldorf. 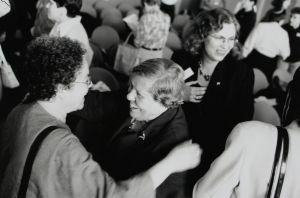 In 1949, Lilli Marx founded the Düsseldorf Jewish Women’s Association (Düsseldorfer Jüdischen Frauenverein), whose members engaged in social work for the community, caring for the needs of survivors and refugees. Similar women’s organizations were re-established in other cities, making an invaluable contribution to the improvement of living conditions among the Jewish community and to the rebuilding of the communal structures. Lilli Marx was invested in creating a coalition among the women’s associations. The year 1953 marks the reinstitution of the JFB as the nationwide umbrella organizationwhich had been banned by the Nazis in 1938. Lilli Marx was, from the first, a member of the board, leading the organization’s business activities. By the mid-1950s the JFB included eighteen womens associations, with a total of approximately 1,700 members from all parts of the Federal Republic. Since the reinstitution of the JFB occurred exactly fifty years after its original founding by BERTHA PAPPENHEIM in 1904, the organization marked the occasion by issuing a book of prayers composed by Pappenheim, which had first been published in 1936, the year of her death, and were re-issued by Bet Debora in 2001. Lilli Marx was profoundly concerned with nurturing the legacy of JFB for the many young women of her generation who were unfamiliar with it. The JFB’s newsletter, “Women in the Community” (Die Frau in der Gemeinschaft), regularly contained articles which referred to the “honorable past of Jewish women’s activities in Germany.” Lilli Marx bore responsibility for the publication of the newsletter, which has appeared as an occasional supplement to the Jüdische Allgemeine since 1956. It was “to reflect the events in its own domain and the opinions and responsibilities of women in the Jewish community, as well as the work of Jewish women throughout the world.” It reported on the activities of the regional associations, the regular working sessions of the JFB and the conferences of the International Council of Jewish Women. However, Lilli Marx always referred not only to Jewish matters but also to those of general concern to all women. Organization of the JFB’s working sessions was another major aspect of Lilli Marx’s activities. The sessions’ agendas included discussion of numerous issues: the duties of Jewish women, professional training in social work, the education of young people, human rights and human dignity, women in developing countries, to name just a few. Well-known women, both Jewish and gentile, were invited to participate in the sessions. Lilli Marx saw the JFB as an integral part of society in general and was therefore determined to include topics which related to contemporary society as a whole. JFB became a member of the INTERNATIONAL COUNCIL OF JEWISH WOMEN in 1954. Three years later, four women from Germany, including Lilli Marx, first participated in one of its conferences. Over the years, Lilli Marx experienced a great deal of suspicion towards the German delegates since many people felt that Jewish life in Germany was totally unacceptable: “We had to run the gauntlet, but we didn’t let them take the butter off our bread,” she said. Lilli Marx headed the JFB for almost twenty years, handing over its leadership in 1972. Thereafter she commuted between Germany and Israel with her second husband, the Israeli author Alexander Czerski, returning to Düsseldorf after his death in 1986. The Women’s League she had established in the city had meanwhile been dissolved. “Women in the Community” had ceased publication in 1980; a few years ago, however, the Women’s League took up issuing a magazine again. The JFB,too, was no longer of any significance in Germany; nowadays, there are a number of local JFB groups across the country. Many of the women born after 1945 identified strongly with the State of Israel and preferred to participate in Zionist activities such as WIZO, where even Lilli Marx found a new sphere of activity. She was also active in the Council of the Düsseldorf Jewish community. Lilli Marx could not conceive of a life devoid of involvement. At the Bet Debora Conference in 2001, we witnessed her as a splendid personality who was interested in life and in everything innovative, and always ready to find enrichment in every human encounter. Lilli Marx died 5 April 2004 at Nelly-Sachs-Haus, retirement home of the Jewish Community Düsseldorf.